As mentioned in Chapter 3, the purpose of applying grounded theory coding procedures (Strauss and Corbin, 1998) in this study is two-fold. The first is to use grounded theory coding procedures as a data management tool, to sort the 540 pages of transcribed interview data into topics spoken about by the respondents. These topics are grouped into larger, more manageable categories. The labels of the categories such as Individual, Family and Social, Organization, Society, National and Environment reflect topics that radiate from the individual as a respondent and how they view themselves in relation to Others and to the larger society. The second is to use the grounded theory coding procedures as a way of making more stringent the manner in which topics and subsequent texts will be chosen for the purpose of discourse analysis. The discourse analysis of the texts will be presented and discussed in Chapter 5. This chapter will present the results of the applied grounded theory coding procedures. The presentation of the results will begin with an overview of the categories, and their most relevant topics are also presented and discussed. Briefly mentioned in the previous chapter, the 252 coded topics were sorted into 6 broader categories that radiated outwards from the Individual as the “starting point” or centre of a socio-cultural fabric. Topics belonging to the Individual category were then followed by other topics that were categorized into the Family and Social, Organization, Society, Nationality and Environment categories. Each category can be seen as encompassing topics in the previous categories, since topics relevant to the larger, outward radiating category are also relevant to the smaller categories closer to the individual. For example, topics in the Family and Social would also be relevant to the Individual category since families are made up of many individuals. Tables 4.1 to 4.3 illustrate the 6 categories, sorted by percentage of topics within each category. The tables also indicate whether the topics were spontaneously spoken of, i.e. the topics were brought up by the respondents themselves or if they were prompted topics, i.e. the topics were brought up by the interviewer. Table 4.1 shows the Organization category as the category that contains the most topics with 45% of the all topics coded under that category. This is followed by the Society and Individual categories that contain the next largest numbers of topics, with 30% and 13% respectively. Table 4.2 shows that the respondents spoke most spontaneously when it came to topics that belonged to the Individual category, or topics that revolved around themselves as individuals. This is followed by the category of Society and Organization with 53% and 44% of spontaneous topics respectively. Table 4.3 shows that prompted topics for the respondents fell mostly in the category of Nationality with 78% of the topics being prompted. This category included topics that pertained to the respondents’ nationalism and their relations to their respective countries, its politics and questions relating to their feeling of national identities. Prompted topics were also abundant in the two categories of Family and Social and Environment with 74% and 67% respectively, indicating that the respondents as a whole did not readily offer information for topics in these categories, possibly because family and their individual social lives make up part of their private domains. The tables below are presented with a relative and absolute difference index, the greater the relative difference in number, the greater the difference in ‘concern’ or interest in topic between the two groups of respondents. The absolute difference is indicative of which group of respondents showed more interest in the topic, whether it is the Asian or Scandinavian respondents. A negative absolute difference usually indicates that the interest for the topic is in the direction of the Scandinavian respondents i.e. more Scandinavians were interested in that particular topic and therefore spoke more about it than their Asian counterparts; whilst a positive absolute difference shows that the interest for the topic lies in the direction of the Asian respondents i.e. more Asians were interested in the topic. The 100 Index which is also shown in the subsequent tables, as mentioned in the previous chapter, makes the two groups of respondents comparable in terms of numbers as there are 23 Scandinavian respondents and 10 Asian respondents. i. data sorted according to prompted or spontaneous topics – the function of which is to allow easy viewing and grouping of topics that were spontaneously brought up by the respondents and which topics needed prompt. ii. the Scandinavian respondents’ point of view sorted according to the Scandinavian 100 Index – the function of which is to allow topics most salient to the Scandinavians to be revealed and grouped together. iii. the Asian respondents’ point of view sorted according to the Asian 100 Index – the function of which is to allow topics most salient to the Asian respondents to be revealed and grouped together. iv. topics of equal interest, i.e. topics that draw near equal interest from both groups of respondents and spoken of by at least 50% of both groups of respondents – the function of which is to gather, sort and reveal topics that were of most interest to both groups of respondents. the Scandinavian respondents’ point of view sorted according to the Scandinavian 100 Index – the function of which is to allow topics most salient to the Scandinavians to be revealed and grouped together. the Asian respondents’ point of view sorted according to the Asian 100 Index – the function of which is to allow topics most salient to the Asian respondents to be revealed and grouped together. topics of equal interest, i.e. topics that draw near equal interest from both groups of respondents and spoken of by at least 50% of both groups of respondents – the function of which is to gather, sort and reveal topics that were of most interest to both groups of respondents. The Individual category consists of 33 topics that pertain to the person where the individuals are encouraged to speak about themselves or did so spontaneously. This category contains 76% of spontaneous topics, which makes this category significant in containing the highest number of spontaneous topics amongst all categories. Appendix 4A contains the full table on the Individual category and the various ways in which the data is sorted. Table 4.4 below (see also Appendix 4A.3) shows topics spoken about by at least 50% of either group of respondents in the Individual category. The topics are sorted according to prompted and spontaneous topics and then according to relative difference in descending order. This shows not only the spontaneous and prompted topics but it shows the topics with greatest difference in interest from each group of respondents, with the topic of greatest interest difference shown first in Table 4.4. There are 8 prompted topics and 25 spontaneous topics in Table 4.4. Amongst the prompted topics, the Scandinavian respondents seemed to discuss getting a broader vision and their sense of history much more than their Asian counterparts. These two topics attracted less than 50% of the Asian respondents’ interests with an Asian 100 Index of 40 and 10 respectively. The Asians preferred talking more about hawker centres and food courts, which are everyday features of Singapore living and eating out in Singapore. These two topics likewise attracted very little attention from the Scandinavian counterparts, with Scandinavian 100 Index of 9 and 4 respectively. Spontaneously, the Asian respondents also spoke about their favourite local (Singapore) food. Most of the spontaneous topics can largely be said to revolve around the individual and their point of view on culture. Whether it’s living in a foreign country or encountering a different culture in their working environment and learning about the new environment and culture in terms of humour or food and knowledge of each other’s language, traditions etc. Text examples 4.a and 4.b below lend examples of transcripts that would fall into the Individual category. These first two text examples will show how the open coding procedure adapted from Strauss and Corbin (1998) has been applied to the data. A description of the open coding procedure and more examples of the coding process can be found in Chapter 3, section 3.4.3. Text examples 4.c onwards in this chapter will be shown without the coding to improve text readability. The above text examples cover topics such as food and Swedes / Europeans vs Chinese / Asians and individual experiences of going abroad or living in Singapore. Appendix 4A.2 shows all topics from the Individual category sorted according to the Scandinavian 100 Index. Table 4.5 shows a delineated version of topics where 50% or more of the Scandinavians have spoken of the topic where the topics seem to reflect the Scandinavian respondents’ point of view and what they deemed interesting to speak about. Table 4.5 is sorted according to the Scandinavian 100 Index, followed by the absolute difference in descending order. The topics of greatest interest to the Scandinavians should show in the top rows. With regards to topics brought up spontaneously by the Scandinavian respondents, their foremost concern or interest seems to be on the topic of language as a barrier, with a -60 absolute difference. The topic of language as a barrier is further explored in Chapter 5 in relation to language as an important aspect to doing business and important for socializing outside of the office. 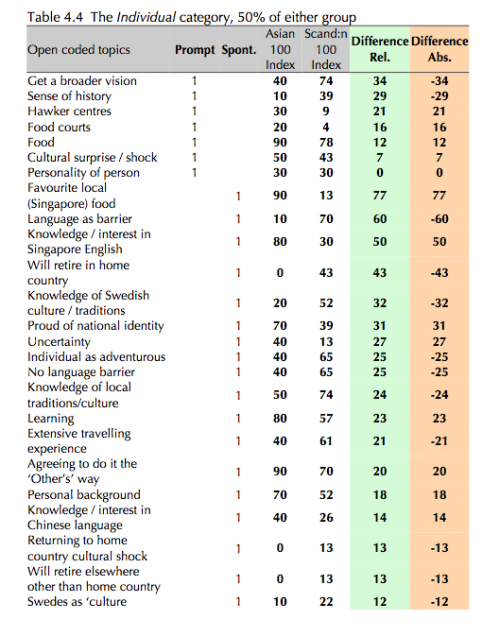 As for prompted topics of interest, the main topic of interest for the Scandinavian respondents was that of getting a broader vision, much like Example 4.c above with M telling of his reason to work abroad in Singapore. Swedish respondent, G also tells of how working abroad has contributed to a broadening of his horizons and personal development in text Example 4.d. The topic of self-identity is also touched upon in both example 4.c and 4.d. These spontaneous and prompted topics from the Individual category, from the Scandinavians’ point of view reflect their everyday lives and experiences that they have gathered, of living and working in a foreign country. Their experiences include witnessing a new culture, new environment and new types of food. The topic of getting a broader vision for example, is one of top interest to Scandinavians possibly because all interviewed have worked overseas for some time. Appendix 4A.1 shows the full category sorted according to the Asian 100 Index. 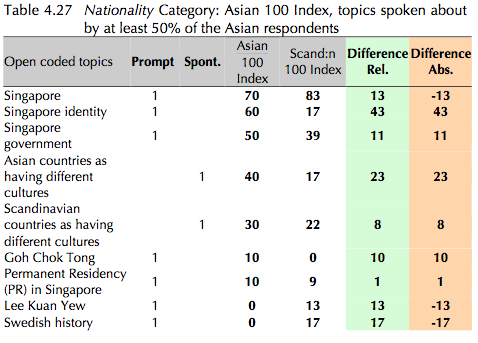 Table 4.6 shows topics where at least 50% of the Asian respondents spoke of the topic, sorted according to the Asian 100 Index, followed by absolute difference in descending order. These topics would reflect what the Asian respondents found most interesting to talk about within the Individual category. The largest absolute differences for the Asian respondents were found in topics that were brought up spontaneously. The topic of most interest for the Asians, with an absolute difference of 77 is the topic of favourite local (Singapore) food. They also spoke interestedly about accommodating the Other, in the topic, agreeing to do it the ‘Other’s’ way. This topic is also explored further in Chapter 5, when investigating strategies within the organization for assimilation and integration between the Scandinavians and the Asians. Text example 4.e shows a Chinese Singaporean L, speaking about honorifics within the organization and thus touching implicitly upon the concept of hierarchy within the organization. L begins by comparing Swedish bosses with local bosses, by saying “they are more informal”. It also shows how the locals accommodate a foreign hierarchic system (in this case, Swedish) in terms of address. In the above example, although C is a Singaporean respondent, he identifies more with ‘Swedes’ by using the word ‘we’, whereas the Indonesian operation is more ‘other’ or ‘they’. Other topics of interest to the Asian respondents are knowledge / interest in Singapore English, with absolute difference of 50 shows that it is a topic that is of little interest to the Scandinavian respondents. Of the lesser interesting topics to the Asians is the topic of knowledge of local traditions / culture. A possible reason for this could be that respondents working in their home country already have an implicit / tacit knowledge of their own traditions and culture, so that such entities are something ‘taken for granted’ rather than something that needs to be learned. While Tables 4.5 and 4.6 highlight topics of interest particular to each group of respondents, Table 4.7 shows topics sorted to indicate topics that are of common interest for at least 50% of the respondents in both groups. These topics in Table 4.7 are sorted according to relative difference in ascending order. The topics of interest to both groups will be shown in the top rows of Table 4.7. The only occurring prompted topic in Table 4.7 is the topic of food, where both groups of respondents seemed interested in the topic of food, although the Asian respondents showed slightly more interest in that topic. All topics in general seemed to have a fairly small relative distance not exceeding 24. The topic with most ‘common ground’ with the smallest relative difference was the topic need to be ‘open’ as individuals, followed by cultural misunderstandings with 2 and 8 as relative difference respectively. The above topics that could reveal or lend insight into the respondents’ approach to integrate with the larger society, cover areas that are outside of the organization. The concept of assimilation and integration within the organization, is further explored in Chapter 5. The Family and Social category consists of topics that pertain to the respondents’ immediate social circle where they speak (mostly) about familial and social relations within the private domain, for example, if they speak of their parents or of their spouses and children. Topics such as how they spend time after working hours socializing is also found in this category. Appendix 4B shows all topics under the Family and Social category, with the data sorted in various ways. This category has 15 topics altogether, which is 6% of the distribution of the 252 main topics. Of these 15 topics, 11 or 74% are prompted topics and 4 or 26% are spontaneous topics, the greater number of prompted topics perhaps indicating that the spheres to which the topics belong are more private rather than public information. 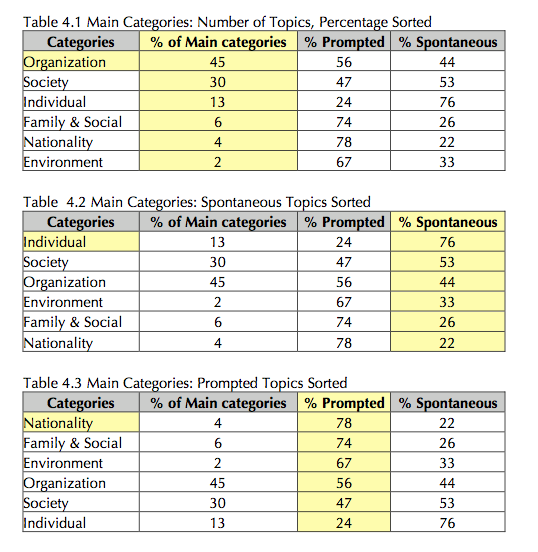 Table 4.8 shows topics in the Family and Social category, sorted according to prompted and spontaneous topics and then according to relative difference in descending order. The prompted topic with the largest relative and absolute difference, – 45, in the direction of the Scandinavian respondents, is the topic on expatriate (personal) friends. This is paralleled by the Asian respondents speaking of their (Singaporean) personal friends, with an absolute difference of 33 in the direction of the Asian respondents. The Scandinavians also spoke more about their family background; most of them described themselves as coming from a middle class family or an ordinary / not rich family, with a -33 absolute difference, while the Asian respondents spoke about Singapore men and children, with 21 and 18 absolute differences respectively. All four spontaneous topics in this category have a negative absolute difference, indicating that it was the Scandinavian respondents who had opened up more during the interview and were more willing to give information on their family and social life without prompting from the interviewer. The topics include expatriate living (-54 absolute difference), Swedes and Singaporeans socializing (-22 absolute difference), mistaken name calling (-22 absolute difference), which also occurs within socializing contexts and expatriates with a local woman (-16 absolute difference), for those who are with a local woman or those who have friends who are dating / married to local women. These four topics seem to broadly reflect their experience of their expatriate status and living in Singapore. Appendix 4B.2 show all topics in the Family and Social category sorted according to the Scandinavian 100 Index. Table 4.9 shows topics from the Family and Social category spoken by at least 50% of the respondents. The data is sorted according to the Scandinavian 100 Index, followed by the absolute difference in descending order. The topic of expatriate living was what the Scandinavians were most interested in speaking about, where they spontaneously talked about Swedes and Singaporeans socializing. Less spontaneously, they talked about personal friends and family. Example 4.h lends a text example of a Scandinavian respondent J, who talks about his experience as an expatriate in Singapore and his socializing experiences with the locals. J’s segment of speech possibly touches on all topics listed in Table 4.9. The main point in J’s discourse is that it is difficult being an expatriate in Singapore since not many Singaporeans wish to socialize with expatriates outside of the office, or beyond ‘office hours’. J’s point of view somewhat concurs with L’s point of view (in Example 4.j below) on how she chooses not to socialize with colleagues after work due to wanting to be with her children and family. Table 4.10 show topics the Family and Social category, spoken of by at least 50% of the respondents, sorted according to the Asian 100 Index, followed by the absolute difference in descending order. The full table sorted according to the Asian 100 Index can be found in Appendix 4B.1. Although L’s point of view is individual, it does concur with J’s point of view that Singaporeans in general, do not socialize outside of office hours. That the two groups, as expatriates and locals, do not socialize outside of work is also found in Example 4.n in section 4.2.3.4 below, when respondent B speaks about networking and having good friends. The friends that B has in Singapore is never quite the same as those he has in Sweden. From Tables 4.9 and 4.10, the two groups of respondents seem to have only one topic in common, with at least 50% of respondents from both groups speaking about family after some prompting from the interviewer. The ‘common ground’ status of this topic has a relative difference of 1. As reflected in the summary Table of this category and again reflected in Tables 4.9 and 4.10, the family and social category contains topics revolving around the respondents’ social life, outside of working hours. The most common things for the Scandinavians to speak about are living as expatriates and socializing with Singaporeans whilst the Asians spoke mostly on the topic of family. Example 4.j seemed somewhat to confirm the Swedish respondent J’s feelings that Singaporeans in general may not wish to or may not prioritize socializing with expatriates all that much outside of organization hours since what is of priority to the Asian respondents are spending time with family. The Organization category is the largest of all the 6 categories, comprising 45% of the overall data or 112 of the 252 topics. Of the 112 topics in this category, 56% or 63 topics are prompted and 44% or 49 topics are spontaneous topics. Appendix 4C presents all topics occurring in the Organization category and the tables found in Appendix 4C presents the various ways the data is sorted. As the Organization category contains many topics, the following sections below will show topics spoken of by at least 50% of either group of respondents, sorted in various ways. In the next chapter, text examples that reflect the more salient topics from the Organization category will be further analyzed using the linguistic framework outlined in chapter 3. Table 4.11 and Appendix 4C.4 shows a delineated summary of the Organization category. The full table of topics in this category sorted according to prompted / spontaneous topics can be found in Appendix 4C.3. Topics shown in Table 4.11 are those with at least 50% of either the Scandinavian or Asian respondents having spoken of the topic. These are sorted according to prompted and spontaneous topics and then according to relative difference in descending order. Table 4.11 contains almost an equal number of prompted and spontaneous topics, with spontaneous topics being only 2 more than the prompted topics, with 16 prompted and 18 spontaneous topics. The prompted topics mostly included that of management styles and what the respondents thought of the management styles within the organization. The distribution of 8 negative and 8 positive absolute differences within the prompted topics show that both groups of respondents shared an equal interest in responding to the questions raised by the interviewer, with each group having an equal number of topics which interested their group. Prompted topics with a small absolute difference include information sharing, Chinese management style, giving direct / clear instructions and business protocols. 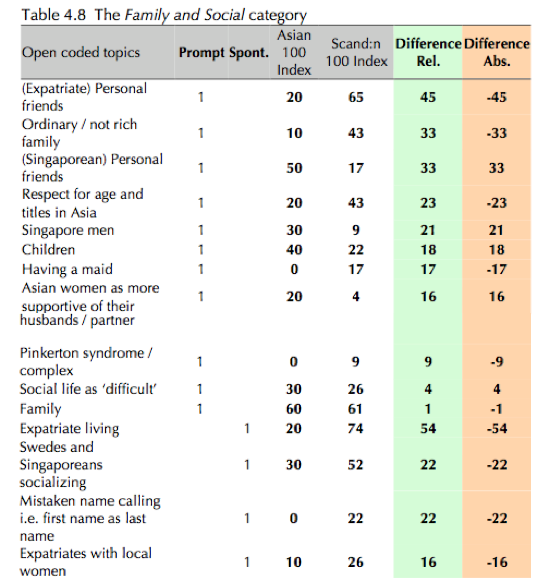 These topics have almost equal attention and interest by both groups of respondents, with absolute differences of -1, -7, -11 and -11 respectively, although the negative absolute differences indicate that slightly more Scandinavians had spoken of these topics than Asians. These topics seem to reflect / contain aspects of communication and elements of hierarchy. Within the spontaneous topics, there are 6 topics with a positive absolute difference and 12 topics with a negative absolute difference, which indicate that it is the Scandinavians as a group that have used more spontaneous topics (in their interviews) than the Asians, in that they went beyond the interview questions and brought up topics of interest of their own accord and spoke about topics that interested them as a group. The spontaneous topic with the largest negative absolute difference of -47 is Singaporeans as lacking initiative. This is followed by the topics of freedom of action within company, transfer of knowledge and expert knowledge / specialization with -40, -38 and -35 respectively. 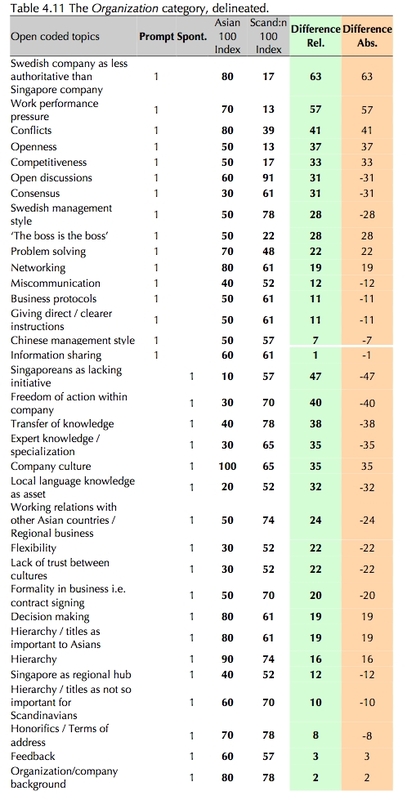 The first two topics discussed by the Scandinavian respondents on initiative and freedom of action within the organization seem to reflect their perception of a difference of management styles and working expectations when working with their Asian colleagues / employees; while the other two topics on knowledge transfer and expert knowledge seem to reflect the reason for the Scandinavians’ presence in Asia. Spontaneous topics containing a small positive relative difference of 2 and 3 include talk about organization / company background and feedback. This indicates that while both groups showed an equal interest in talking about these topics, the positive relative difference indicates that slightly more Asians spoke about this topic. Small negative relative differences of -8 and -10 include hierarchy / titles as not so important for Scandinavians and honorific / terms of address, topics that were spoken about only slightly more by the Scandinavians than the Asians. The following sections will go into each group’s point of view and topics that specifically interested the two groups. 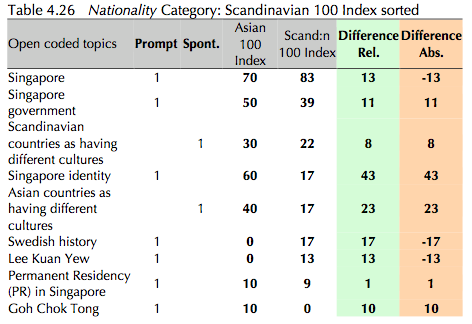 Table 4.12 and Appendix 4C.2 shows the topics within the Organization category sorted according to the Scandinavian respondents’ point of view, according to the Scandinavian 100 Index in descending order, followed by relative difference in descending order. The Table shows topics that were spoken of by at least 50% of the Scandinavian respondents. 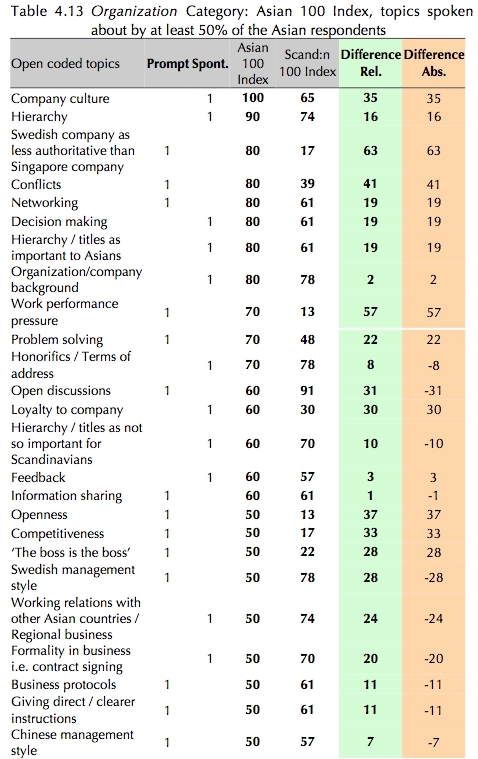 The two most interesting prompted topics for the Scandinavian respondents were open discussions and the Swedish management style, with more than 70% of the Scandinavians speaking of these topics, after which, spontaneous topics seemed to be of greater interest for the Scandinavians. Spontaneous topics generally seemed to center around the individual and his / her immediate surrounding in the organization such as talking about their organization / company background, how people address each other within the office in terms of honorifics, and how the organization is hierarchically structured etc. Generally, these topics can be said to reflect a broad outline of the Scandinavian (mostly Swedish) management style of working. The topic of work performance pressure which features quite high on the Asian respondents’ list of interesting topics for example, does not seem to feature as part of the Scandinavian working style or the topic does not appear as a pressing issue for the Scandinavian respondents, featuring a Scandinavian 100 Index of 17 compared to the Asian 100 Index of 70. 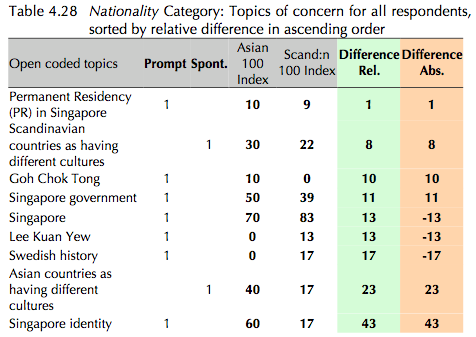 Table 4.13 and Appendix 4C.1 shows topics that reflect the Asian respondents’ perspective, sorted according to the Asian 100 Index in descending order, and then by relative difference in descending order. There are 5 prompted topics that seem to be most interesting for the Asian respondents with more than 70% of the respondents speaking of these topics, including Swedish company as less authoritative than Singapore company, conflicts, networking, work performance pressure and problem solving. These topics seem to reflect a comparative mode of talk where the Asian respondents talk about the difference between the working styles between the Swedes and Singaporeans, the work pressures that they feel and how they may manage problems at work, as an everyday work experience. Spontaneously, more than 70% of the Asian respondents seemed to also discuss their organization culture, hierarchy within the organizations, honorifics and how they address each other at work, networking processes and decision making processes. Table 4.14 and Appendix 4C.5 shows topics of equal interest to both Scandinavians and Asians, where 50% or more of either group spoke of the topic. These topics in Table 4.14 are sorted according to relative difference in ascending order. Topics of salient interest for both groups of respondents are those with small relative differences, which are found at the top rows of Table 4.14. A common characteristic of the above topics, and perhaps generally from Table 4.14, is that the topics seem to exhibit characteristics that would allow them to be grouped into two larger concepts, that of (i) hierarchy and (ii) assimilation and integration. Hierarchy as a concept refers broadly to how the power within the organization is structured, distributed and shared. Assimilation can be defined as a process, “a decline and at its endpoint the disappearance of an ethic / racial distinction and the cultural and social differences that express it” (Alba and Nee, 1997:863), it refers to the giving up of one’s cultural heritage and roots so as to adopt the cultural heritage of the Other, in order to be absorbed into the dominant culture (Petersson, 2006). Integration is also a process, but one that differs from assimilation in that one gets to keep one’s socio-cultural heritage, sharing one’s own cultural knowledge with the dominant culture, thus becoming an incorporated part of the dominant culture with recognized differences (Goldmann, Pedersen and ∅sterud 1997; Petersson 2006). Some scholars have viewed the process of integration as a facet of assimilation, where integration is arrived at prior to assimilation (Roy, 1962). While assimilation and integration are relatively different concepts, the concepts were grouped together into a single topic, for coding and subsequently text sorting purposes. The differences in these concepts will be analyzed linguistically, in accordance to how the respondents spoke about their experiences in becoming part of the dominant culture. And for the moment, they will be referred to as one unit, which is assimilation / integration. These topics of hierarchy and assimilation / integration, are spontaneous topics in themselves that occur within the Organization and Society categories, with the topic assimilation / integration having an absolute difference of 9. With the help of Table 4.14 in showing up the most salient groupings of topics, the topics of hierarchy and assimilation / integration can be explored further in terms of cross-referencing and the building of its concepts from more topics from Table 4.11. The following sections will discuss the cross-referencing and the relating of other topics in a similar vein from Table 4.11 to hierarchy and assimilation / integration in order to form larger concepts. Whilst Table 4.14 was useful in showing the saliency of the groupings of the topics, it is more useful to group topics from Table 4.11 so that a more comprehensive overview of topics related to hierarchy can be obtained. Gathering all topics from Table 4.11 that can be related to the concept of hierarchy within organizations, Table 4.15 shows the groupings of topics from Table 4.11, into the larger concept of hierarchy. The topics are grouped according to the Asian perspective i.e. what the Asians tend to talk about when talking about hierarchy and the Scandinavian perspective i.e. what the Scandinavians talk about when talking about hierarchy. The blank sections in this table indicate a non-corresponding concept in either the Asian or Scandinavian group of respondents for that particular concept. Table 4.16 presents topics on hierarchy spoken by at least 50% of the Scandinavian respondents. 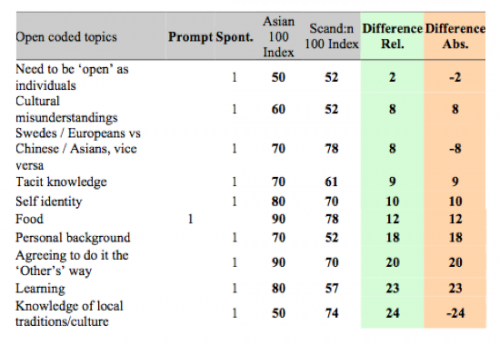 The dark grey print under the open coded topics column in Table 4.16 indicates topics that have also been spoken of by more than 50% of the Asian respondents. The three topics of freedom of action within [the] company, consensus and Singaporeans as lacking initiative in black print indicate topics spoken of only by at least 50% of the Scandinavian respondents. Both topics are notably spontaneous, from the Scandinavians, and rank fairly low on the Asian 100 Index with 30 and 10 respectively. That the Asian respondents hardly talk about these topics could be due to that they may be quite unaware of any lack of freedom within the organization, Singapore having a more authoritarian working model than Sweden for example (Hofstede and Bond, 1999; Hofstede, 1980). Employees taking their own initiatives is also not always appreciated by Chinese Singaporean leaders as they work on a centralized decision making model, as compared to the Swedes (Jönsson, 1995). This text will be investigated further via discourse analysis in the following chapter. Table 4.17 shows a compilation of topics from Table 4.11 that relate to hierarchy for the Asian respondents, thus forming the concept of hierarchy from the Asian respondents’ perspective. 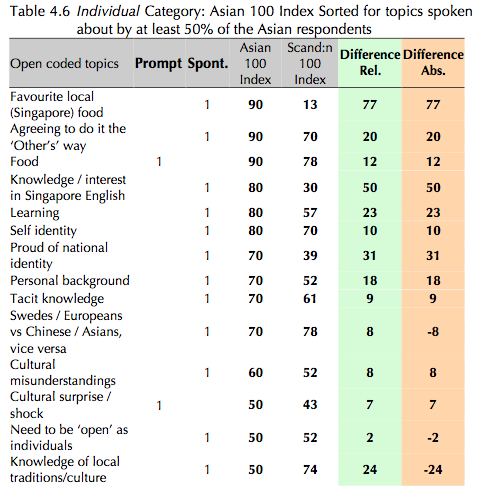 Table 4.17 shows that many topics spoken of by at least 50% of the Asian respondents were also shared by at least 50% of the Scandinavian respondents (shown in dark grey print). But how these topics are spoken of and with what attitudes is not revealed in the table above. The above text example will be further investigated with the use of discourse analysis in the following chapter. The topic of assimilation / integration occurs in the Society category as a spontaneous topic, and is spoken about by more than 70% of both groups of respondents. As mentioned previously, ‘assimilation’ and ‘integration’ are quite different concepts (Goldmann, Pedersen and ∅sterud, 1997; Petersson, 2006) but they have been put together for coding purposes. Further investigation into language use in Chapter 5 will reveal more about how the respondents view ‘assimilation’ and / or ‘integration and whether or not they had assimilation and / or integration strategies when working with each other. Table 4.11 shows some other topics that may relate to the topic of assimilation / integration within the Organization category. These related topics potentially form a larger concept and a group of topics that may point towards integrative strategies used by respondents when working in cross cultural environment in their organizations. Table 4.18 shows topics that can be grouped under the larger concept of assimilation / integration, mentioned by both groups of respondents. The blank cells on either side, shows a lack of a corresponding topic for either group of respondents. Table 4.19 shows the concepts related to assimilation / integration for the Scandinavian respondents, where at least 50% of the respondents were interested in the topics. The topics are sorted according to the Scandinavian 100 Index in descending order. 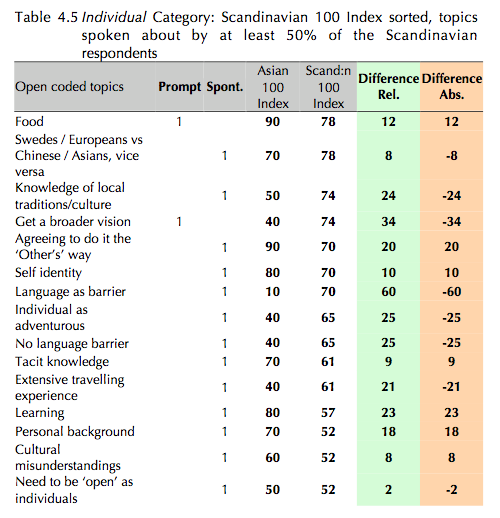 From Table 4.19, it can be observed that many topics spoken of by at least 50% of the Scandinavian respondents were also shared by at least 50% of the Asian respondents (shown in dark grey print), except the three topics of miscommunication, lack of trust between cultures and local language knowledge as asset (shown in black print), the first topic is prompted whilst the latter two are spontaneous. Table 4.20 shows the concepts related to assimilation for the Asian respondents. The shared topics spoken of by at least 50% of the Scandinavian respondents and by at least 50% of the Asian respondents are shown in dark grey print. The above text examples for hierarchy and assimilation / integration, in Examples 4.k, 4.m, 4.n and 4.p, make plausible text examples that will be further analyzed with the SFL framework. These text examples span an adequate length that makes it possible for them to be linguistically analyzed via discourse analysis. These texts will be analyzed in the following chapter to uncover each speaker’s point of view, attitudes and ideology on the related topics. The Society category is the second largest category after the Organization category, containing 77 topics or 30% of the 252 topics. It also contains the second largest group of spontaneous topics, after the Individual category, with 41 spontaneous topics or 53% spontaneous topics. The rest of the 36 topics are prompted and they make up 47% of the topics in the Society category. As there are many topics to the Society category, a full table with all topics in the Society category can be found in Appendix 4D whilst the following sections will present a delineated number of topics, topics spoken of by at least 50% of either group of respondents. Table 4.21 shows topics from this category sorted according to prompted and spontaneous topics spoken of by at least 50% of either group of respondents, with relative difference in descending order. The topics are sorted according to prompted /spontaneous topics, and according to absolute difference in descending order. The full table for this category sorted according to prompted / spontaneous topics can be found in Appendix 4D.3. 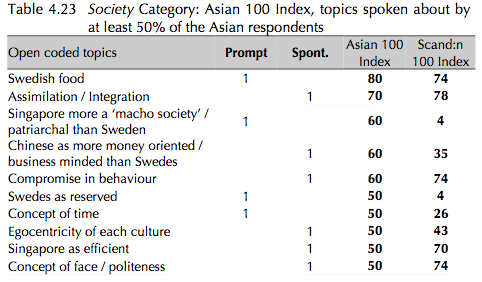 Table 4.21, shows that the topics in this category are varied, with prompted topics spanning a wide variety of issues, from the respondents comparing patriarchy in Singapore to Sweden to how Singaporeans perceive Swedes. 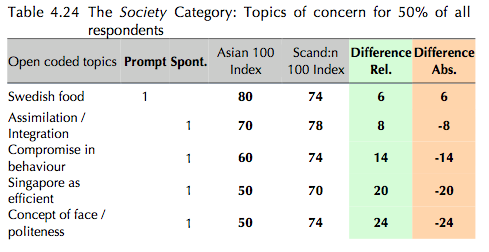 As with some other categories, the Asian respondents spoke more on prompted topics than the Scandinavian respondents. 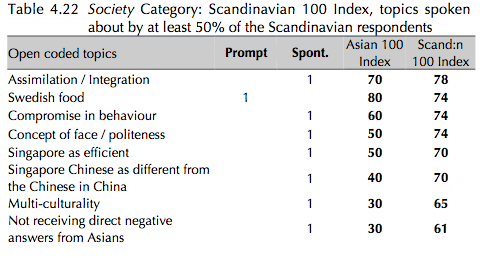 This behaviour of the respondents is indicated by the large positive absolute difference in the prompted topics for the Asian respondents and with the large negative absolute difference for the Scandinavian respondents in the spontaneous topic respectively. The largest absolute differences appear in the topics of Singapore more a ‘macho society’ / patriarchal than Sweden and Swedes as reserved with an absolute difference of 56 and 46 respectively. 6 out of the 9 spontaneous topics in Table 4.21 leaned towards the Scandinavian respondents as the more active in talking about these topics. The spontaneous topics of multi-culturality, not receiving direct negative answers from Asians and Singapore Chinese as different from the Chinese in China seemed to be of most interest to the Scandinavians with absolute differences of – 35, -31 and -30 respectively. 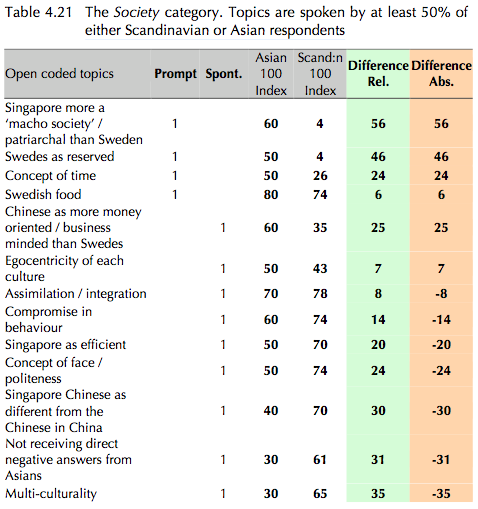 A possible explanation for this interest from the Scandinavian respondents is that the rather homogeneous societies in Scandinavian countries provided an observable contrast to the multiracial, multicultural character of Singapore in particular, where the Singaporeans would also have a different understanding about politeness and the concept of face. 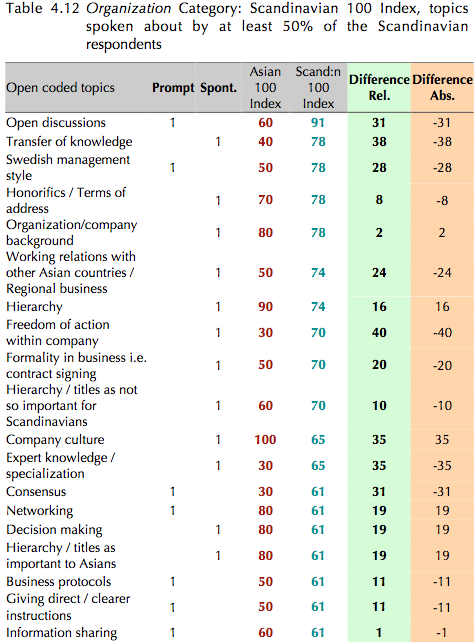 Tables 4.22 shows the topics sorted according to the Scandinavian 100 Index in descending order, and reflect the Scandinavian respondents’ point of view in terms of what topics interest them most. The topics of most interest for the Scandinavians will appear on top of Table 4.22. The full table can be found in Appendix 4D.2. The topics of Singapore Chinese as different from the Chinese in China, multi-culturality and not receiving direct negative answers from Asians, drew little interest from Asians possibly because the Asians are ‘living’ these topics, in that they have grown up in a multi-cultural society and they well understand their own politeness codes within their own society. Multiculturality is thus the norm and that their understanding of politeness in the Asian society operates on a tacit level, a taken for granted concept where individuals do not usually discuss politeness but rather, act accordingly to situational contexts and behave as they were taught from as children. Table 4.23 shows the topics of most interest to the Asian respondents, sorted according to the Asian 100 Index in descendinfg order. Topics of most interest to the Asian respondents will be grouped at the top of Table 4.23. These topics do not necessarily include at least 50% of the Scandinavian respondents talking about them. The full table can be found in Appendix 4D.1. What comes across in P’s discourse is the awareness of an existence of an egalitarian system in Sweden that is perhaps not so prominently found in Singapore, where in Singapore, a more authoritarian, and relatively masculine society (Sweden, according to Hofstede (1984, 1980) is one of the most feminine countries of his study) has different gender roles for men and women in society and different employer-employee relationships. Table 4.24 shows topics of equal interest to both groups of respondents, where at least 50% of the respondents from each group were active in talking about the topic. The topics are sorted according to relative difference in ascending order so that the topics most common to both groups of respondents will appear on top of Table 4.24. The topics with the smallest relative differences are Swedish food and assimilation / integration. Compromise in behaviour is also a topic with a small relative difference. In general, topics in Table 4.24 can large be said to revolve around assimilation / integration, in terms of compromising in behaviour and learning or observing each other’s concept of face or politeness. Example 4.q for example shows how Singaporean P learnt to avoid certain topics in causal conversation when in Sweden, since the topics may offend Swedes. Even the topic of Swedish food could be related to assimilation / integration if it is a means for persons to understand each other through how much of each other’s culture or food they take to. Example 4.b for example is Singaporean L, who speaks about her experience of Swedish food when she was in Sweden, where one can gather from her text whether she tries to assimilate when staying in Sweden. Part of M’s approach when it comes to business protocols and understanding the Other’s concept of face is to observe the genres of meetings in general and then compare it with other cross-cultural meetings to which he has been. M compares for example business protocols in meetings in Denmark, the United States, Singapore and China. While the openings of a meetings are generally the same, a nice talk in the beginning, he notes that in China, the first five, ten minutes… you are just sitting and looking at each other… you do not really say that much and that to M, Chinese meetings tend to be like a theatre somehow, which calls for M to adjust his behaviour accordingly during those meetings. The Nationality category is one of the smaller categories, containing 9 topics all in all or 4% of the 252 topics. Appendix 4E shows all topics and tables related to the Nationality category. As this category contains a fairly small number of topics, the tables in the following sections will present all topics sorted in various ways. 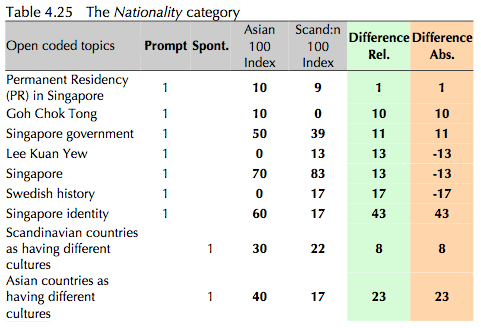 Table 4.25 shows the topics in the Nationality category sorted according to prompted / spontaneous topics, and then according to relative difference in ascending order. The topics with as little difference between the two groups of respondents will be grouped at the top of Table 4.25 for the prompted and spontaneous sections. This category has 7 prompted and 2 spontaneous topics. Most topics in this category revolve around countries as a unit, its politics, government and key persons within the government. Whether in prompted or spontaneous topics, the Asian respondents seemed to have a more active role in this category as indicated by the greater number of positive absolute differences. Table 4.26 shows the Nationality category sorted according to the Scandinavian 100 Index in descending order, followed by the absolute difference in descending order. From table 4.26, there is only one prompted topic, Singapore that has more than 50% of Scandinavians talking about it. Spontaneously, the Scandinavians spoke most about Scandinavian countries as having different cultures (as in Example 4.u). The other prompted topic that they seemed quite enthusiastic about, with a –17 in absolute difference, is Swedish history. Topics that were not too interesting for the Scandinavians included (talking about) Goh Chok Tong who was Singapore’s Prime Minister after Lee Kuan Yew and (talking about) the Singapore identity, which has an absolute difference of 43 in the direction of the Asian respondents. Table 4.27 shows the Nationality category sorted according to the Asian 100 Index and then according to absolute difference in descending order. From Table 4.27, there seems to be three prompted topics all revolving around the topic of Singapore, in which more than 50% of the Asian respondents spoke about. Of least interest to the Asian respondents are politicians such as Goh Chok Tong or Lee Kuan Yew. Obtaining a Singapore permanent residency (PR) or having a Singapore PR is also not an issue with Singaporeans. Table 4.28 shows topics in the Nationality category sorted according to relative difference in ascending order. Smaller relative differences are indicative of a greater common interest for the topic between the two groups of respondents. From Table 4.28, there seems to be only one topic, that of Singapore, spoken of by at least 50% of respondents from both groups. The other topics in common are those indicated by lower relative differences. The topic with the smallest relative difference is about Permanent Residency (PR) in Singapore i.e. whether the respondents held a PR status in Singapore. This topic though, was spoken about by less than 50% of either group of respondents. The other topic that had about equal interest from both groups of respondents with a relative difference of 8, is the spontaneous topic of Scandinavian countries as having different cultures. This topic was not spoken about by many respondents, with an Asian Index of 30 and a Scandinavian Index of 22, but it could possibly have come about from the Scandinavians who wished to point out that Scandinavian countries do have different cultures although the countries are situated in proximity on the global map. The Asian respondents working with Scandinavians perhaps also noticed that Scandinavians as a group do have different working styles that possibly reflect a difference in the Scandinavian cultures. The word ‘environment’ has been used in the coding process in its broadest sense, covering both ecology (air, water and climate) and physical surroundings or milieu. The Environment category is the category with the least number of topics. It contains 6 topics all in all or 2% of the 252 topics. Appendix 4F shows all sorted tables for the Environment category. Table 4.29 shows the environment category sorted according to prompted / spontaneous topics and then according to relative difference in descending order. There are 4 prompted and 2 spontaneous topics in this category with topics pertaining to the natural world surroundings such as climate, weather, environmental settings and milieu. Spontaneously, the respondents spoke about physical and geographical surroundings or milieu, comparing that of Sweden and Singapore. Topics that involve the definition of ‘environment’ with reference to ecology such as recycling are mostly prompted, perhaps indicating that the topic of environment as such, is not perhaps at the forefront of thoughts in the minds of the respondents. Although Singapore as a country is slightly more developed than Indonesia, C himself had problems understanding the Swedish point of view in terms of environmental awareness and incorporating environmental friendly organization goals. These environmental friendly goals, to the Indonesians for example (and in part the Singaporeans), were considered unnecessary and hindered business expansions for the Swedish company in Asia. Table 4.30 shows all topics in the Environment category, sorted according to the Scandinavian 100 Index, followed by absolute difference in descending order. The topics most interesting for the Scandinavians would show up on top of the table. B’s thoughts on ‘environment’ include his attitudes to climate, how Singapore functions as an international city and a place for his family to live comfortably while he is stationed in Singapore. Language seemed an important aspect of what is important in a new surrounding and he compares this with being in Thailand, where a lack of a common language may pose difficulties for his children and family. Table 4.31 shows the Environment category sorted according to the Asian 100 Index and then by absolute difference in descending order. The topics most interesting for the Asian respondents are at the top of the table. Example 4.x reflects to some extent what was said by C in Example 4.v, that environmental awareness has not developed in Asia to the extent that it is in Scandinavia, in particular Sweden. So that arrangement of space, recycling procedures and even eco-friendly architecture that is energy conserving are not mainstream concepts for organizations. But in Example 4.x, it is mentioned that the Swedish organization in which respondent A works has put forth large efforts in making the organization environment friendly, by checking water quality, saving electricity etc. Table 4.32 shows topics of interest for both groups of respondents. The table is sorted according to relative difference in ascending order. The topics most common between the two groups will appear at the top of the table. The only topic with more than 50% of both groups of respondents speaking of it was Singapore environment, which also had the smallest relative difference. The Singapore weather was also talked about as ‘common ground’ topic, although not many respondents in either group spoke of it. Topics with the greatest absolute differences in the direction of the Scandinavian respondents include Singapore’s tropical climate and talk about the Swedish environment. For the Asian respondents, only one topic indicated a larger interest in the direction of the Asian respondents and that is the topic of recycling. Recycling as a topic did not generate much interest in either group though, with rather low Asian and Scandinavian Indexes of 20 and 4 respectively. Example 4.x lends insight into talk of recycling a n d environmental awareness with Asian respondent A. This chapter presented an overview of the results achieved from applying only the coding procedures from grounded theory (Strauss and Corbin 1998) to the interview transcripts, which renders a form of quantitative analysis of the 252 (spoken) topics discussed. The tables in general highlighted topics that were of interest to either group of respondents, depending on how the data was sorted. The numbers in the tables also indicated and pegged the existing differences of interest between the two groups of respondents for all topics. Since the answers given by the respondents and the results are broadly based on the open / guided interview questions, one could possibly turn to the statistics yielded for the spontaneous topics as indication of the more natural interests of the respondents. With regards to speaking spontaneously, the two groups of respondents showed different characteristic traits when talking about the topics. The Scandinavians for example, took up more topics spontaneously overall, with a total of 4447 Scandinavian 100 Index, compared to the total of 4130 Asian 100 Index for spontaneous topics. The Asians however, were overall slightly more talkative in prompted topics, with a total of 3290 Asian 100 Index for prompted topics compared to the Scandinavian 100 Index total of 3082. While the explicit message from L focused on her inadequacies and self-consciousness, the implicit message could be perceived as L talking about the inadequate customer service in Scandinavia. L could also perhaps be talking about her experience of a culture shock. The text example begins from L’s realization that the taxi driver was not going to help her carry her luggage up to the hotel lobby in the middle of winter. The total Asian 100 Index for implicit spontaneous topics is 240 compared to the total Asian 100 Index for explicit spontaneous topics at 173. The results of the coding procedures did indicate that the Asian respondents spoke more implicitly about things, referring to entities / happenings in an oblique manner when speaking on spontaneous topics, but whether this characteristic trait is due solely to the collective / family oriented nature of the Asian respondents and whether the coding procedures parallel findings in Triandis’s (1995) and Hofstede’s (1980, 1982, 1984) studies is uncertain, from just looking at the Main Table and its data. The specific topics of interest in each category for each respondent group also indicate their varying perspectives on the themes discussed in the interviews, reflecting the interests of both groups of respondents and what they consider to be immediate concerns to themselves as individuals. For example, we saw that the Asians spontaneously chose to speak about their favourite local (Singapore) food whereas the Scandinavians spontaneously chose to speak about language as [a] barrier within the Individual category. On a personal level, many Scandinavians also spontaneously spoke of retiring in their home country whilst the Asians, who were mostly Singaporeans, spoke about their interest and knowledge in Singapore English. Similarities of interests can also be obtained from looking at the overall topics. For example, on the family and social level, both groups of respondents seem to speak about their family and how having a social life is difficult, whether it is socializing with colleagues after work for the Asian respondents or if it is the Scandinavians socializing with locals as not a common situation. • do these topics generally reflect the collective / individualistic cultures outlined by Triandis (1995)? • do they correspond to the cultural dimensions of Hofstede’s (1980, 1982, 1984) studies? Questions relating to culture specific observations are also raised by the coding procedures. The possibility of an existing ‘food culture’ in Singapore for example, has been implied by both groups of respondents with relatively high indexes, a 90 Asian Index and a 78 Scandinavian Index. The high indexes revealing that there has been a lot of interest in the topic of food (found in the Individual category). • is there an existing ‘food culture’ in Singapore? And how integrated are the Asians and Scandinavians in terms of liking food from the Other culture? • what types of knowledge reside in both groups of respondents? How does knowledge transfer occur between both groups of respondents? From the above questions, it can be seen that the grounded theory coding procedures lays a foundation upon which hypotheses and theories can be built, acting as a ‘starting point’ of research, as it were, to further exploration of larger concepts. In this study, the coding procedures helped primarily to indicate topics to be grouped together for further linguistic investigation. It helped to pinpoint important categories (by size and number of total topics) and salient features within the categories, that of hierarchy and assimilation / integration. And within these topics, the coding procedures also helped to highlight topics that were similar or dissimilar, occurring or non- occurring in either group of respondents. • how similar / dissimilar are each group of respondents views on management styles and on the concept of hierarchy? The following chapter contains the linguistic analyses of text examples from the more salient topics of the largest category, the Organization category as revealed by the grounded theory coding procedures.